How can I see messages I send in Mail 5's Conversation View? I love Mail 5's new Conversation View. But, I don't like that it only shows messages sent to me, and doesn't show the messages I send. Is there a way to show both messages I receive and messages I send in Conversation View? 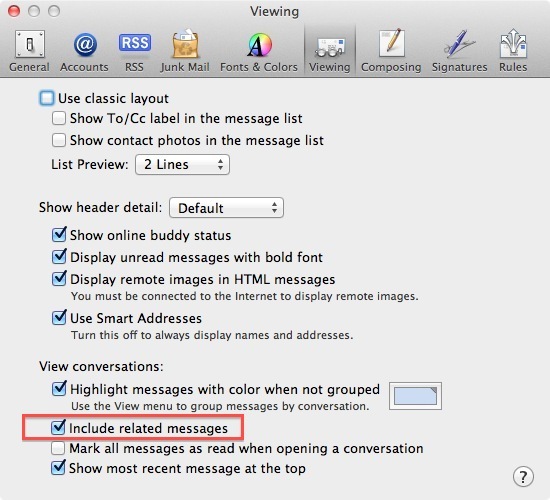 Go to Mail-> Preferences-> Viewing and check Include related messages (under View conversations: at the bottom). This will show "related messages", which (as far as I can tell) means messages that you send in the same conversation. Not the answer you're looking for? Browse other questions tagged macos lion mail.app email . how to send scheduled mails with Mail? How can I re-map Mail's “Sent Messages” folder to an IMAP server's “Sent Mail” folder? How can I get “related emails” on iPad, like in Mac Mail.app? How to copy all messages of a conversation in one folder? How do I get the messages view back in Mail on OS X? How do I split a Mail conversation in two?